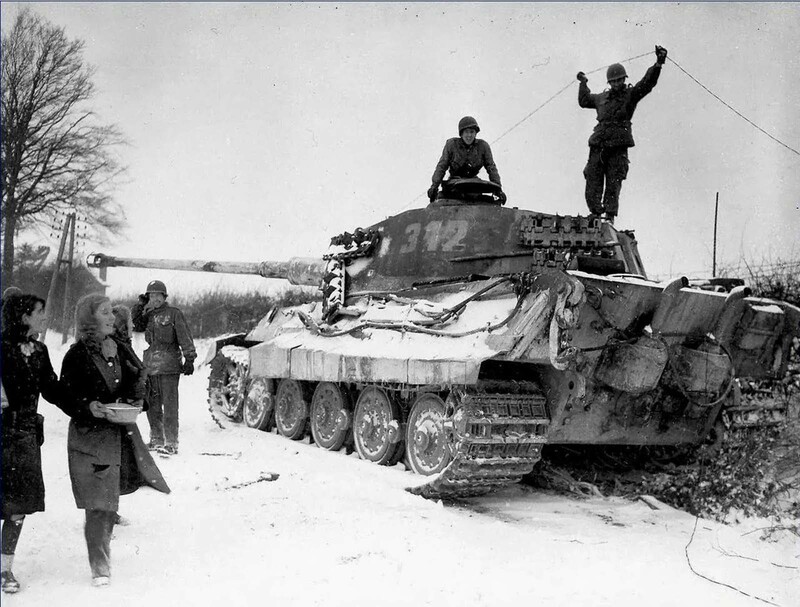 Two American soldiers inspect a destroyed German King Tiger tank, Belgium, 1944. Two American soldiers inspecting a destroyed German King Tiger tank and at the same time admiring the three beautiful passing girls. Photo taken near the village of Corenne, Belgium, 1944. The tank in the photo is Tiger II number 312, of the 3rd company 501 SS schwere Panzer Abteilung and 82nd Airborne Division troops. Most likely this tank ran out of gas. 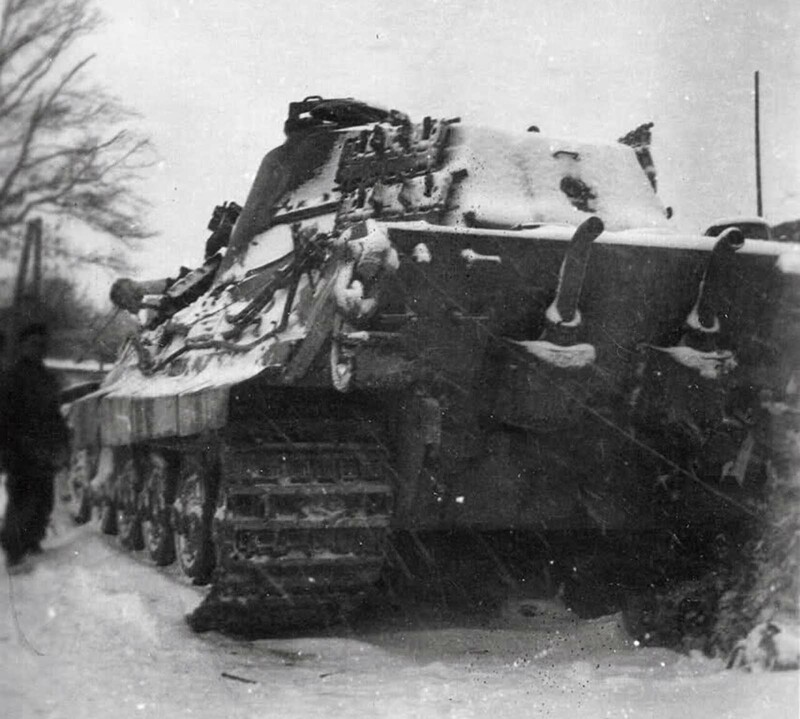 Most of the time during the Battle of the Bulge, the ever thirsty King Tigers were either stuck in traffic on the narrow winding roads or desperately looking for American petrol dumps that hadn’t been blown up before they got there. Or there could have been a bridge. All the tanks that didn’t break (or run out of fuel) got stopped by the first bridge they came to. Tiger II weighed 70 tons. The next heaviest allied tank was 46 tons. Proper bridges where no problem for the Tiger, but smaller bridges could be a problem if the river banks where too steep for it to be forded with snorkel. Underpowered like many of the World War II heavy tanks, the engines consumed a lot of fuel at a time when it was in short supply for the Germans. One of the most feared weapons of World War II, the King Tiger tank donned an almost impenetrable front armor. Produced by Henschel, the King Tiger was introduced into action on the Eastern Front in May of 1944. The final official German designation was Panzerkampfwagen Tiger Ausf. B, often shortened to Tiger B. It is also known under the informal name Königstiger (the German name for the “Bengal tiger”), often semi-literally translated as the King Tiger or Royal Tiger by Allied soldiers. The Tiger II was developed late in the war and built in relatively small numbers – 1,500 Tiger IIs were ordered, but production was severely disrupted by Allied bombing. Among others, five raids between 22 September and 7 October 1944 destroyed 95 percent of the floor area of the Henschel plant. It is estimated that this caused the loss in production of some 657 Tiger IIs. Only 492 units were produced: 1 in 1943, 379 in 1944, and 112 in 1945. Another photo from the same tank. The tank design housed a crew of five. The main gun specification of the King Tiger was to be a variation of the 88mm anti-aircraft gun, capable of destroying enemy tanks from a great distance. The velocity of this gun was about 1,000 m a second when firing an amour piercing round. The gun’s accuracy allowed it to pierce 150mm of metal armor even if the tank’s position was more than 2 kilometers away from the intended target. The shell’s ability to travel at about 2,200m in an estimated 2.2 seconds (and sometimes even faster) meant this tank had the capability to destroy enemy tanks from a distance, keeping the Tiger out of enemy range. The King Tiger Tank was not without its problems. Underpowered like many of the World War II heavy tanks, the engines consumed a lot of fuel at a time when it was in short supply for the Germans. The fuel consumption problem was exacerbated at the Battle of the Bulge. Here, the Tigers first appeared to do quite well, but subsequently, they literally ran out of fuel. Soldiers were forced to abandon their tanks and walk back to their lines. Great photo. So many things happening in it. It looks like the two young ladies are bringing some hot soup or casserole to the soldiers. The Tigers were so over engineered they sometimes broke down as they were being delivered to the receiving unit. I was watching a WW2 documentary and one of the men talking was a replacement tanker who was walking from the beach to the front after the Normandy invasion. The first Tiger he saw had broken down and he counted 18 times by US tank rounds. All the rounds had done was knock of some paint. 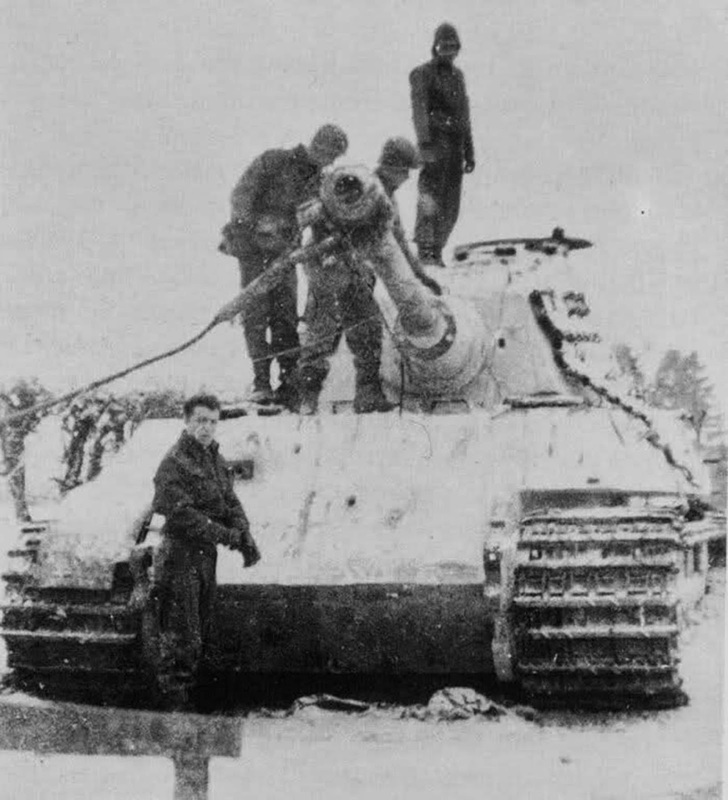 Another problem for the tanks in the Battle of the Bulge, a majority of the German tanks had no antifreeze glycol and they had to startup the engines on schedule to keep the oil and water hot/warm. This 'turning over the engines' was quite loud so keeping undetected in the forest before the assault was challenging. The antifreeze production plants were a top priority for the Eight Air Force.